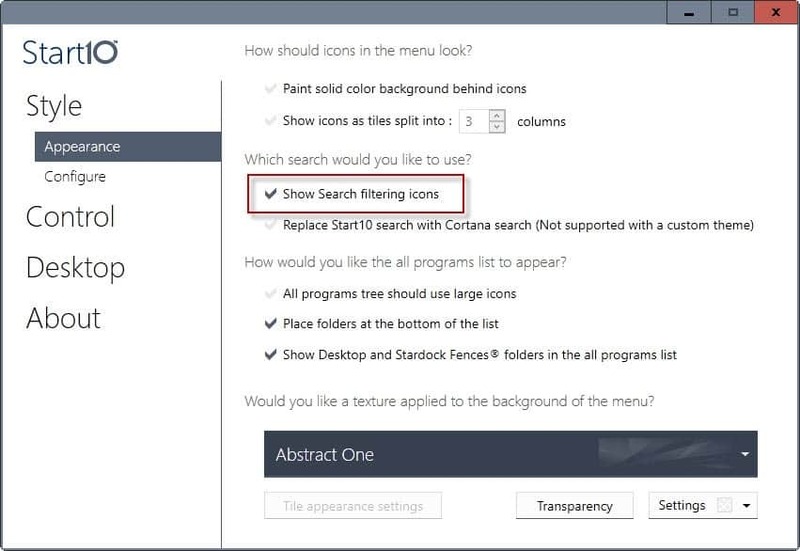 Stardock released a new version of its start menu replacement software Start10 for Windows 10 today that introduces search filters and integrates with the company's Fences program. Stardock created the program - then called Start8 -- for Windows 8 initially to offer an option to users of the operating system to bring back a classic start menu. Start10 was released for Windows 10 to provide users of the operating system with access to a classic start menu and modern variations. The most recent version of Start10 brings along with it two features that Windows 10 users may find interesting. All users benefit from search filters that the program displays when you run searches on the operating system. As you may know, you simply tap on the Windows-key and start typing to run searches. The option displays a list of filter icons at the top that list only results of a particular type when activated. It is for instance possible to only display settings, programs, documents or music files. The feature is not enabled by default. Switch to Style > Appearance. Check the "Show Search filtering icons" option on the page that opens. Start10 separates results automatically if you don't use search filters, so that programs, settings and other types of results are listed as groups on the search results page. The second new feature of Start10 1.5 is integration of the company's Fences program. Fences is a productivity program for Windows that enables you to file shortcuts and programs into groups, and place those groups on the desktop. It improves the chaos that is usually "the Windows desktop" by grouping icons and files into so-called Fences. Each fence encapsulates all icons, so that you may move, hide or roll it up including all icons that it contains. If you use Fences, you will get a listing of each Fence in the start menu. You may disable that option, if you don't want that. One interesting aspect of the new feature is that the entries may display in different colors to better distinguish them from regular start menu entries. If you have selected a custom color for a fence, that custom color is used as the background color of its entry on the start menu. 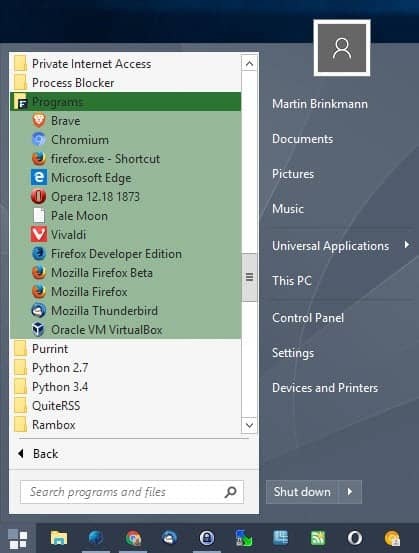 You may change the color of individual fences, and the change is reflected automatically when you open the start menu. No color is shown if you have not modified the color of a fence, but it is still highlighted with an F in the folder icon. Additionally, all desktop items are highlighted as well with a different color (those not placed in a fence). Start10 1.5 is available for download at the Stardock website. The program is commercial, but available for the reasonable price of $4.99. Fences is also available on the Stardock website; it is available for $9.99. 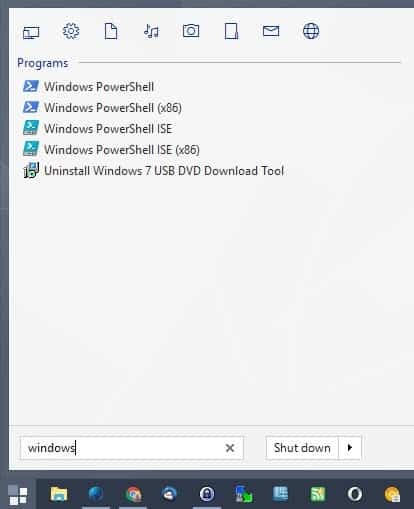 Now You: Do you use the regular or a third-party start menu when you use Windows? Folder is in C: and has all the needed links. I never touch the bottom left icon of doom. No need for that. You can make Toolbar on taskbar with all folders and subfolders. That happens a lot for me as well. Started with the latest update. Onwards I used Blackbox 4 Windows.